This is a road trip that includes a bit of everything: mountains, nightlife, a stop at the “navel of the world” and the seaside. The drive to Arachova from Athens becomes more and more interesting as one approaches coming from Livadeia; with Mount Elikona on your left and the snow-capped peaks of Parnassos ahead, the colorful village leaps out after the second tunnel, sometimes under a cloudless sky, and at other times semi-shrouded in a mist that is perhaps even more becoming. Even if everywhere else is packed, the parking lot at the exit of Arachova towards Delphi, always has some free spaces. Walk along the central street where you will find café-bars, shops with ski equipment, clothes and jewelry, as well as bar-restaurants that will keep you out until early morning. One of the newest options for accommodation are the adults-only suites of Almond House Arachova, which are fully independent and have fireplaces. (tel. +30 6932 457666, starting from 100 euros including breakfast). After Arachova, take the road heading to Delphi and you will find yourself moving along the lower slopes of Parnassos, where the firs are progressively replaced by olive trees. As you approach the archaeological site, the light and clouds often engage in a playful dance. Personally, I never omit a stop at the Kastalia Spring, just before the last turn for the Temple of Apollo. Due to the distinctly fewer tourists during the winter period, the mystical aura of the sites is even more pronounced. 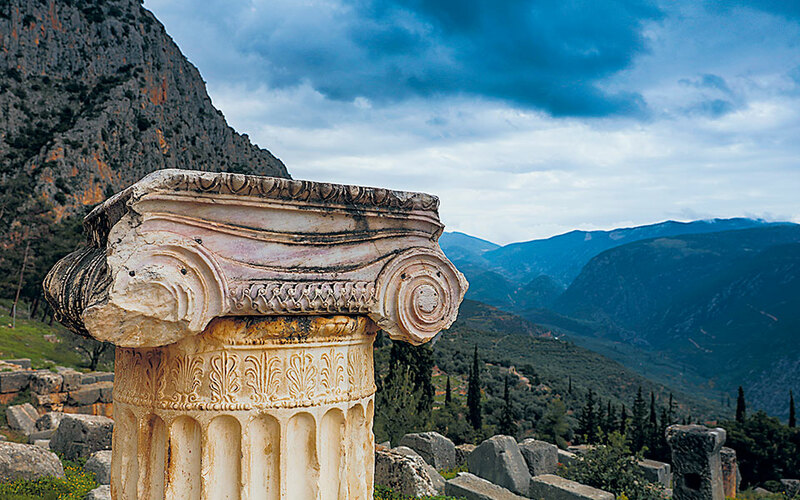 Pay a visit to the Delphi Archaeological Museum where you will find the bronze Charioteer of Delphi, along with other exceptional finds. Make another stop at the village for a coffee at Agora (tel. +30 22650 83116) and for food at Patriko Mas (+30 22650 82150). The breathtaking view is reward in itself and will make clear the beauty to follow. 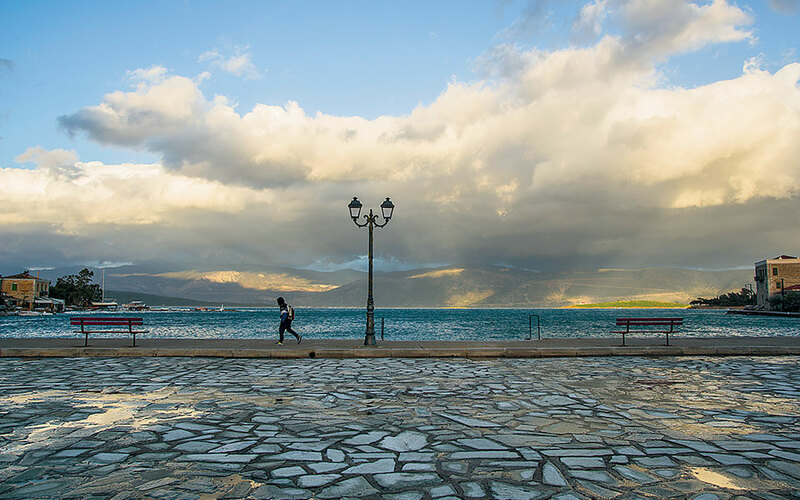 The Corinthian Gulf unfolds in front of your eyes, and the plain of Amfissa with its olive trees completes the scene. After Delphi, a rather easy route begins, where one can drive along the shore until Galaxidi. You can explore the village’s rich maritime tradition with a visit to the Naval and Historical Museum (tel. +30 22650 41795). Then wander around the little harbors, and admire the picturesque lanes and alleys lined with the neoclassical houses of the captains of old. Try kelemia (stuffed onions) at the taverna Bebeli, and stroll from Pera Panta until the statue of the Galaxidi Mother. Shellfish exist in abundance at this time, so if your appetite calls for crayfish and other seafood, opt for the taverna Maritsa (tel. +30 22650 41059). It has a great reputation for its lobster and pasta dish, and has recently relocated to this side of the harbor. Afterwards, if you wish to spend the night in Galaxidi, there are many beautiful guest houses, such as the renovated mansion Nostos (tel. +30 22650 41266, starting from 50 euros, including breakfast) on Iroon Square. For your return journey, you can choose either the same route via Delphi and Arachova, or continue along the coastline, passing through Itea and heading inland along a road which is full of bends. You will travel through villages such as Desfina and historic Distomo. Essentially you will be completing a circular route, traveling through the foothills of Mount Elikonas, until you find yourself again on the Arachova-Livadeia road and turn back towards Athens. 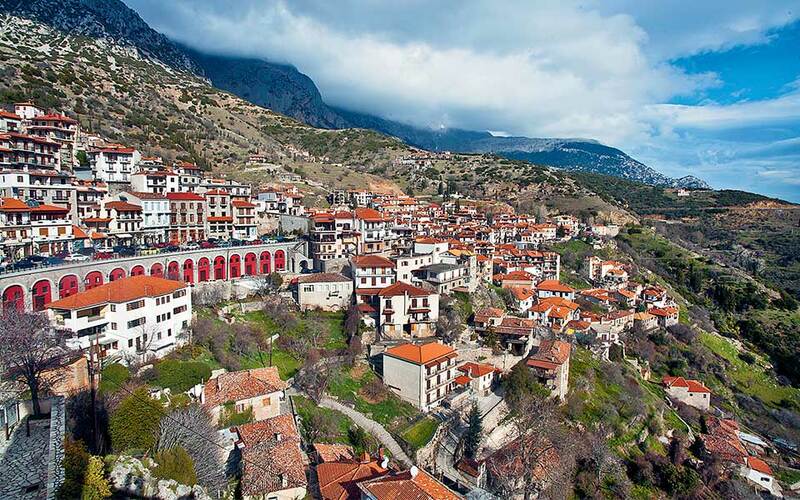 The basic recommended route Arachova-Galaxidi is 44 km. The recommended return route Galaxidi-Distomo is 51 km.